Lebanese Forces leader Samir Geagea and Marada Movement leader Suleiman Franjieh struck on Wednesday a historic reconciliation, ending four decades of enmity triggered during Lebanon’s 1975-90 civil war. 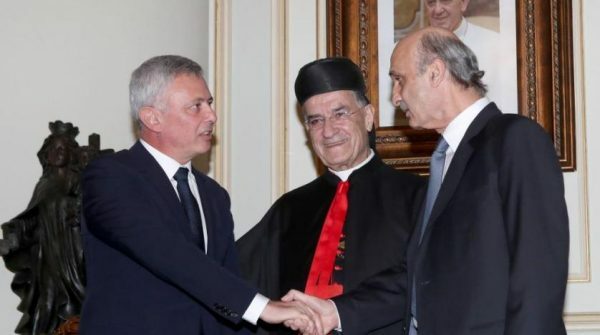 The two Christian leaders shook hands and kissed each other on the cheeks at the headquarters of the Maronite patriarchate in Bkirki. The reconciliation was sponsored by Maronite Patriarch Beshara al-Rai. Geagea and Franjieh, both presidential candidates, had met in the past, but Wednesday marked the end of a bitter rivalry tainted with blood. “It is so nice for brothers to sit together. I welcome you through prayers as happiness fills my heart and the heart of all Lebanese,” al-Rai said in a speech after the two leaders met in front of journalists. Their reconciliation comes at a time when both their relations have become tense with Foreign Minister, Jebran Bassil, who heads the Free Patriotic Movement founded by his father-in-law President Michel Aoun. Franjieh is a close friend of Syrian regime leader Bashar Assad and is allied with the Iranian backed Hezbollah militant group , which is also allied to Aoun. Geagea is a harsh critic of both Assad and Hezbollah. In 1978, members of the main Christian militia killed Franjieh’s father, Tony, as well as his mother and sister and 30 Marada fighters and supporters. The Marada held Geagea responsible for the massacre, saying he was leading the raid on that day. Geagea has repeatedly denied the accusation, saying he was wounded on the outskirts of Ehden and was transported to hospital at the time and that he was not responsible for the results of the raid. Last week, Franjieh met with the families of those killed four decades ago and asked if he can go ahead with the reconciliation and received their support. Former Marada MP Salim Karam had previously told Asharq Al-Awsat that the reconciliation was imposed by the interests of the two parties. It paves the way for a presidential alliance and a path for the goal that Geagea and Franjieh want to achieve, he added. Just as the understanding between the LF and FPM lead to the election of Aoun as president, a similar understanding could take place between the LF and Marada to elect one of their leaders as president, he explained. “We are therefore headed towards a presidential battle,” Karam remarked.